I was raised on the basis of ‘work smarter, not harder.’ This adage rings in my ears for just about everything I try to accomplish. However, we all know about the road of good intentions and where it can ultimately lead you. Sometimes my head knowledge doesn’t always make it to my tactile abilities. 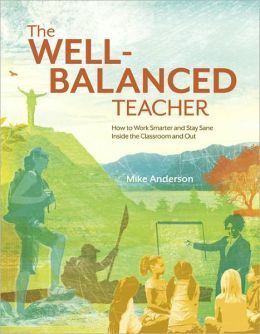 In Mike Anderson’s book, The Well-Balanced Teacher-How to Work Smarter and Stay Sane Inside the Classroom and Out, head knowledge is put to use with easy application. Instead of providing a bunch of lip service and suggestions backed by research, Anderson gives application ideas and examples of how to actually put the suggestions into action. I’m a huge application person, so I of course approached some of Anderson’s ideas with skepticism, knowing how full my day as a teacher is, and knowing that unless you’ve actually been in a busy elementary classroom, ideas that sound great on paper do not always pan out in real time. So, I put myself, and Anderson, to the challenge and applied some of his suggestions. Let’s start out with what ‘The Well-Balanced Teacher’ attends to. First and foremost, Anderson establishes the importance of basic needs for teachers: nutrition, hydration, sleep, exercise and emotional and spiritual refreshment. He then adds to that basic list the needs for belonging inside and outside school, the idea of significance which is making a positive difference through our work, the need for positive engagement where we enjoy what we do and that ever-sought-after balance for both inside and outside of school. Whew. My anxiety level began to heighten as I read through this list, knowing that I was currently experiencing every single thing on that list! As teachers we all know how difficult it is to eat properly, stay hydrated as we are trying to teach and move about the classroom, not to mention how we would almost worship being able to see the inside of a bathroom stall and actually use it! We also know how elusive that feeling of refreshment can be, then add to the way we question ourselves about ‘making a difference’ and ‘being engaged’ and I know I am not nearly as balanced as I should be which leads me to not always enjoying what I do. And these are thoughts that roll through my mind just on the drive into work. After Anderson backs up all of these ideas with some truly wonderful research, he then starts to unwrap them one at a time and gives several, yes SEVERAL, different methods of application for each. I’m a sucker for choices! So, I went through the list and prioritized each need. I chose the two ‘physical well-being’ ones to try to implement that were high priorities for me, but not easily accomplished: Nutrition and Hydration. Simple, right? Not for me. I will preach and preach to my kids about the importance of breakfast, yet I never eat anything before lunch. I know, I know. Hypocritical. So, I started grabbing something as simple as a yogurt cup to eat on the way into work, or during my thirty minute prep time before my little people started coming into class. Easy application! And I was amazed at how something so small made a large change overall. I went ahead and added the hydration to this as well, keeping a water bottle at my table and getting in the habit of actually drinking it throughout the morning. I know these seem like very simple things, but they were things that I, personally, was missing. I went forward and tackled the top two ‘emotional well-being’ items that I felt needed to be implemented: Competence and Balance. Ugh. These were a bit trickier. I’ve never been one to rely on outside evaluations or compliments to define my competence in the classroom. Although my marks are always high, I am my own worst critic, as I’m sure most teachers who strive to go over and above what is required of them are. So competence was a difficult one to fulfill. What I did do though was engage in even more reading than I already do, tackling tougher subjects like brain-based learning that I knew would help me expand my knowledge-base. This helped me feel like I was continuing my own learning process and not just teaching all the time. For the balance part of the equation, I added an extra thirty minutes to the end of my day to focus on the details that I usually took home, like recording grades or tedious grading assignments. This allowed my evenings at home with my family to be uninterrupted by schoolwork without me feeling like I was neglecting tasks that needed to be done for my students. I’m sure these sound like very simple implementations, but for me they were huge. Anderson acknowledges that a small change can earn large returns. Sometimes suggestions are so overwhelming that one can get very discouraged with the whole premise of trying to make huge changes all at once, only to realize that you’re setting yourself up for failure. Anderson encourages teachers to start out slowly, making small adjustments in our busy day, and eventually adding to the adjustments as one sees fit. He also provides numerous, practical suggestions for implementation, which really, truly can be easily put into motion for us busy teachers. A perfect read! Disclaimer: This book was provided to The Educator’s Room free of charge by the publisher. However, neither The Educator’s Room nor the reviewer received any compensation for this review. The opinions contained in this review are those of the reviewer alone and were written free of any obligation or agreement with the publisher. If you have any questions regarding book reviews, see our full disclaimer or contact the Book Review Editor.